A team of British scientists has discovered tunnels that are almost as tall as the Eiffel Tower under an ice shelf in Antarctica. 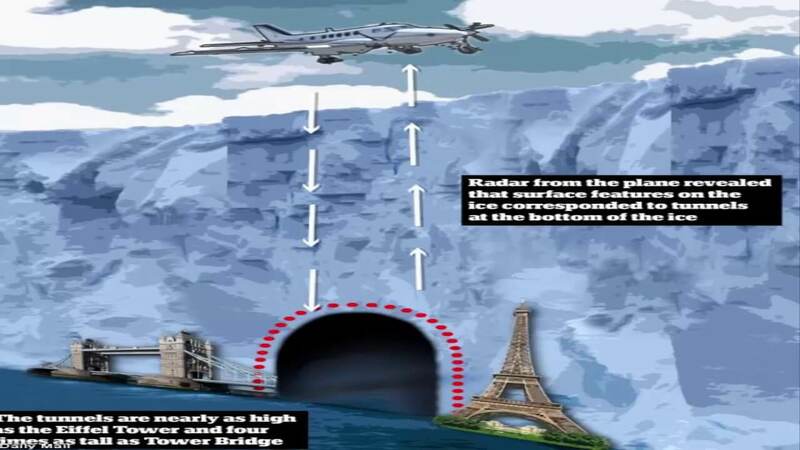 Researchers from a number of UK universities and the British Antarctic Survey – a research centre based on the continent – detected the tunnels when they flew a plane over the Filchner-Ronne Ice Shelf in West Antarctica. Radar from the plane, as well as satellite photos, revealed that ridges and cavities on the surface of the ice sheet corresponded to tunnels lying at its base. The data revealed that water moved beneath the ice in concentrated channels, similar to rivers. Scientists previously thought that meltwater flowed underneath ice sheets in more evenly-spread, thin, continuous sheets. Researchers used a specially-modified Twin Otter aircraft to make the discovery. The plane, designed to operate in remote environment, was fitted with remote sensors that provided scientists with data on the land, ice and sea that it flew over. Specially-designed radar equipment deciphered the tunnels under the ice – it can also be used to pick out layers within the ice itself. Longer-term monitoring from the air can be used to record the break-up of ice sheets or atmospheric changes. The British team will now use its newfound knowledge of the under-ice tunnels to predict how exactly that ice shelf will melt in response to climate change. The researchers published a paper about their work in the journal Nature Geoscience.